And then I told him he should read “Monet’s Passion: Ideas, Inspiration & Insights from the Painter’s Gardens by Elizabeth Murray (Pomegranate Communications, $35.00) and find out about the gardens. In her book, Elizabeth Murray provides an in-depth look at Monet’s gardens in Giverny, France, the kind of in-depth look that only someone who has worked in Monet’s gardens and visits them annually can provide. In the introduction, we get a brief glimpse of the story of Murray’s first visit to Monet’s gardens and how that visit changed her life. “Changed her life”, by the way, is a bit of an understatement. After her first visit to the gardens, she was so taken by them that she quit her job, learned French, and returned to Monet’s garden to work as a volunteer gardener there for nine months. 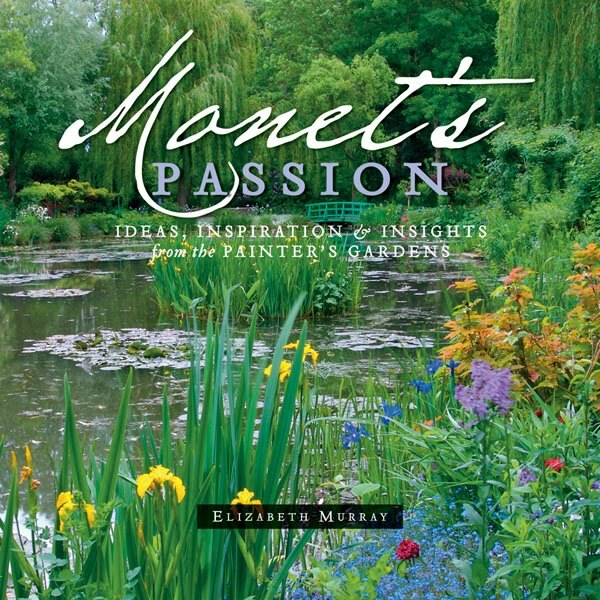 To find out more about her story, I listened to an online NPR interview where Elizabeth Murray tells us in her own words about working in Monet’s gardens and also about being a gardener. I loved it when she said, “I’m a gardener, no - work!” quite emphatically in response to the interviewer’s question about why she just didn’t go back and admire the gardens. She went on to explain the different relationship you have with a garden when you actually work in it and see it in all of its seasons, when you can walk off the paths and into the borders and beds, when you can be alone in the garden. And it is from this viewpoint, from this working relationship she developed with Monet’s garden, that she wrote “Monet’s Passion”. For those interested in the history of great gardens, Murray starts the book with a history of Monet’s gardens and how they were developed. For those who think they might visit or want to visit Monet’s gardens, she provides a description of the gardens as they are today and includes a generous assortment of photographs of the gardens. For those who love Monet’s gardens and would like to have gardens like them, Murray explains how you might recreate some small part of these fabulous gardens in your own garden. I love that approach, the three parts of the book, because most gardeners when captivated by a garden would love to know how the garden came to be, how it is today, and how they can try to make their garden look like that garden. Or at least I do. For those who would like their own copy of Monet’s Passion to read and enjoy, Pomegranate Communications has offered to give a free copy to one lucky winner. To enter, leave a comment below telling us about a garden that you love and would love to model your own garden after. It can be a famous garden, an obscure garden, your neighbor’s garden, whatever garden inspires you. Please make sure the comment leads me to your email address so I can notify you if you are the winner. This giveaway ends at 9 pm EDT on Tuesday, August 10, 2010. I’ll chose the winner via random drawing and notify them via email. Thank you to Pomegranate Communications for sending me this book to review and for sponsoring this giveaway. 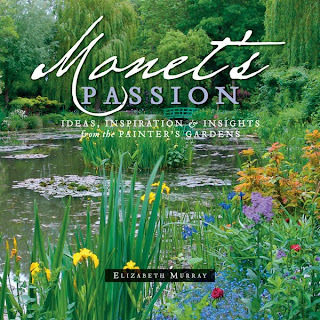 And thank you to Elizabeth Murray for an inspiring, insightful and colorful book on Monet’s gardens. The winner is lucky commenter number 8, "Aisling". Congrats, I'll be in touch with you to arrange for you to get your book! The three parts of that book sound like an interesting way to structure a gardening book. The most memorable to me is Great Comp in Kent - when I visited, the eccentric garden maker was still there telling the story of how he and his wife, both retired civil servants had made the quirky place essentially on their own. It was a very personal dream and inspired me to try and make my own dream place. I had an opportunity to visit Colonial Williamsburg. The gardens were wonderful. I was there in the fall, but the gardens bloomed like it was summer. I had an opportunity to speak and learn from one of the gardeners there. I adore Monet's garden as well. So peaceful. I would love to win the book. Wow, I have really wanted to read a book on Monet's gardens! Picking just one garden to model mine after is a difficult challenge... but I really love the UNC Chapel Hill Botanical Gardens. I think they really hit that southern style of gardening I love. I have been to Giverny and seen Monet's gardem. It is so exquisitely beautiful and peaceful. I could only dream of ever having a garden that beautiful, so I would have to settle for having a garden more like a person who lives a few blocks from my home. They have a lot of perrenials in their yard and then add some annuals every year. It is very beautiful. While I love Monet's garden, I am now enamored of the Lurie Garden in Millenium Park, Chicago. I have seen it in different seasons and talked at length with a volunteer gardener. That is my vision for my 3 acres. Well, the meadow at least, and I will have to interpret it for the woodland. As one who stands before Monet's paintings of his gardens with tears running down her cheeks, those are the gardens I wish mine could be. Elizabeth Murray's adventure is one I could embrace ... oh, to have such an opportunity! This Book sounds like a treasure. I loved touring Butchard Gardens. The part I liked about such a large garden is the way color was freely infused into the garden. I would love to have more color in my garden, especially this time of year. I love perusing the Missouri Botanical Garden in St. Louis. Every time I visit I see something else I'd like to incorporate into my own garden. This sounds like a wonderful book. Just one inspirational garden? I have several. After visiting Provence, I planted a row of lavender. Skimpy, yes but it reminds me of the Provence lavender fields. After a trip to Villandry, I changed my raised-bed vegetable plot to a formal French potager complete with miniature boxwoods and a rose standard. After visiting Giverny, I was taken by the knee-high apple tree espalier and came back and planted my own. After visiting Kuekenhof, outside Amsterdam, I planted hundreds of tulips and a "river" of muscari. After seeing them in Niagara Falls, I created a diamond-shaped dwarf pear tree espalier. My wife is now afraid to take me places. Over the years I have visited many garden shows, permanent gardens for viewing and for my own garden I would like a stone garden wall, a babeling brook, and many of the older flowers I love. I would like a trellis covered with pink rambling roses like my grandmother had, an white easter lily garden she accumulated over many easters, I would like hollyhocks and lillies-of-the-valley like I planted alongside our garage when I was ten, I would like a french lilac bush like the one that won my Dad a ribbon one year and some regular lilacs also. I would like a bed of violets surrounding a stone patio with benches I could sit on and birdhouses and bathouses to welcome wildlife. Unfortunately I have only window sills but they are well populated with flowers and greens and I have 2 bat houses on my little square of land and 2 birdhouses hanging off the upper eaves where the cats can't get to them. Life is fine. I don't think I'm trying to replicate a particular garden so much as every natural place that inspired wonder in me as a child. I was surprised at how small Moent's garden was when I saw it. It looks much bigger in his paintings. I'd love to go back sometime when it's not the last day of the season. I can't think of a single garden that inspired mine unless the Washington park Arboretum in Seattle has influenced me subliminally. We were on a garden tour in England and the Isle of Jersey.We saw some great estate gardens,but the one that stuck with me was a private garden on the Isle of Jersey belonging to Judith Queree. She and her husband have created a small intimate garden filled with plants they love,something inspiring around every corner. I'm fascinated by Japanese gardens. I have a side yard I'm committed to doing in that style. I've looked at a lot of books, but we've planned an actual trip to Kyoto next fall so I'm thinking of just waiting until then before I really get started. I think it will be very different to see them in person and get the actual feel of them. I'd like to recreate something authentic and I think the trip will help me to do that. The Missouri Botanical Gardens in St. Louis have a wonderful Japanese garden section that I've visited many times. I think that's the garden that got me started with this idea. By the way, I love your blog. You're fairly nearby in Indianapolis which means we share some of the same issues with regards to weather and zone. You're far more committed than I am though! My dream garden? Just that, my dream: a part of childhood growing up on a farm, with northern woods surrounding, the sound of birds, bees, all sorts of insects. Wildflowers growing as they will; space and freedom. In real life, I just strive to bring something to my suburban garden that will bring those memories and feelings back to me. Thanks for your blog, a delight every post! I love the Hershey gardens, especially the Japanese section of it and the area with the tea party set up in the trees for children (I believe it was from Wind in the Willows? ), and would be thrilled if our garden were as pretty. Thank you so much for the giveaway - my mother loves both Monet and gardens and would love this book. I love gardens everywhere. My favorite is one from a painting that has a crystal clear stream, an elegant white gazebo and numerous plants blooming in vivid coulours. We have a community garden in the middle of our town. It sits on a couple hundred acres, has a alden b dow house, and many famous sculptures around the whole garden. It is just beautiful. There is such a thread of contentment in your post. I love the part about the garden versus the painting. VanDusen Gardens, the meditation garden, no photos allowed. I would like one of those. I would try to model my neighbor's original garden. She knew so much about flowers and what birds came to eat at each one. It was a bit wild but I liked about it and there was color in it 9 monthe out of the year. Would love this book! My mother-in-law's garden is my idea of a great place. She has an easy, casual touch with her plants and landscaping, and it is both beautiful and comfortable at the same time. My Mom's garden when she was alive. I wish I had the touch that she did with flowers. The Garden at the California Institute of Technology inspires me! I used to go there all the time as a child because my Grandma worked there. I have a picture of me when I was four by the flowers, I love the picture so much. I also love Monet and that particular photo always reminded me of The Japanese Bridge painting! So I hope I win because he is my favorite Impressionist Painter! I wish my garden looked like Glebe House in Connecticutt. It was designed by Gertrude Jekyll and shows just how amazing the subltle color changes and range can be on just a city lot around a sweet, but ordinary small house. Much more manageable than Giverney, but just as inspiring! I've always wanted to see Monet's garden! I hope to some day, but in the meantime, reading this book sounds like the next best thing. It's hard to pick a garden I would like to have--every garden I see inspires me. I think, though, I would pick our Master Gardeners Idea Garden for my favorite, just because I've enjoyed visiting it the past few years, but now that I'm actually working in it as well, I notice so much more. Not to mention, I'm learning from some great teachers! I think of our backyard neighbor Frances Leach in Louisville, Kentucky, back in the 1950s. She had a beautiful walled rose garden with brick trails, tended it all herself, and best of all, welcomed tiny children to come play in it. I'll never have a formal garden like that (and no tea roses here in Texas) but my own more xeric yard did attract a young butterfly hunter this spring. Exciting! How could I pick one garden? Every garden I've ever seen or visited has influenced me. But if I had to narrow it down, I'd say Layanee's Ledge and Garden has influenced my perennial border (such as it is) and your vegetable garden has always been an inspiration, Carol. It would have to be the Huntington Library and Botanical Gardens. Unfortunately, I'll need more space for all the different styles! I have been to a few famous gardens, one of them being the park in Peterhoff, St Petersburg Russia. But I am big fan of Monet, so that is why I would love to read this book. I was walking down a sidewalk in Ely, MN and found the most wonderful little garden with a little path meandering through all the perennials. I keep trying to recreate the feeling but haven't gotten there yet. I love the gardens of Colonial Williamsburg and have visited them in all seasons. Several years ago I was fortunate enough to take a guided tour and learn more about their origins and about many of the plants. The garden I would most love to visit, though, is one I can only visit in my imagination and that's the wonderful walled garden in "The Secret Garden" by Frances Hodgson Burnett - a place that brings about healing in many ways. Ever since reading that book I have wanted to have such a place. My neighbor has a garden that has a stream running through it powered by a fairly powerful waterfall at the top of it. It reminds me of a mini lazy river. It has the dark red wood chips bordering everything. I would love to have a garden just like it. Plants and flowers have always fascinated me and given me a sense of serenity. I have frequented the Botanical Gardens in the Bronx and have come away richer for it. I don't know about any one particular garden. All offer calmness, peace and tranquility. My favorite garden is Frelinghuysen Arboretum, in Morristown, NJ. Growing up around such beautiful teaching gardens where many of the plants were labeled allowed me to learn what each plant looks like through every season. I've been going there for almost 15 years and there are still new plants to discover. They do a wonderful job. I'm with kyara above. As much as I love Monet's garden, I want to create a Japanese garden (or as close as I can come with my budget in Ohio). I can't afford to go to Japan, but from my mother's photos (she lived there for years) and books and the web, I've compiled some favorites, especially Ryoan-ji. I would love to recreate Monet's garden, but I don't have the space. I have to settle for a front yard garden. Oh that book looks magnificent! What wonderful gardens to use as an inspiration for areas of plantings (I do find inspiration for my porcelain art in my garden and in nature)… I think of my garden as an extended portion of myself. The time I spend there tending to the plants and the ground, and learning how nature moves through it - really makes me feel at home there. Thanks for the opportunity to win the book! Our neighbors a few streets over have a gorgeous looking yard, which I'm always thinking of when I choose new plants and layouts for our yard. I love color, texture, and aroma. I also love birds, butterflies and other wildlife. Thank you for the wonderful giveaway. My parents actually have a beautiful garden that I wish we could replicate here, but our soil differs too much :( They have a lovely Japanese theme, with fountains, and beautiful Bonsai trees, along with gorgeous flowers that I can only wish I had! I love the garden in Howl's Moving Castle! It's a great film. I admire every garden I see in Better Homes and Gardens. I'd also love to have one like my mom's. She grows everything from cuttings. Is there a gene for the love of gardening that can be passed on like blue eyes or red hair? Physically, my mother and I have little in common, but we both love gardening. If I had to choose a garden that influenced and inspired me, it would be hers. Every spring, the perennial beds exploded in an unrestrained riot of bright colors that lasted until fall. There was no artifice, no great design, ornaments or koi ponds. The flower beds were cut straight as arrows. Yet it is that plain little garden, always breathtakingly beautiful in its simplicity, that I return to for inspiration. Our garden club is having a presentation this month on the Gardens of Giverny! I would love to have the book! I recently discovered Powell Gardens in Kansas City and love so many things about it. When we first moved here - I loved the gerden (that "came" with the house) - but being the black & blue thumbed amateur that I am - it took me about five years to pretty much ruin it (a tragic combination of ignorance exacerbated by excessive doting and over zealous ambition. I would give this book to my next door neighbor who absolutely loves gardening and reading any and everything about gardens. Having recently lost her husband of many years, she has really thrown herself into the work, and though it was stunning before, it is even more so now, and I reap the benefits daily just by living next door. Her inspiration comes from within herself, she just 'does what she likes,' or so she has said many times, and for her, and those of us next to her, it really pays off. I love gardening/reading please pick me! Many years ago we visited the Botanical Gardens in St. Louis. Our whole family loved it there. My neighbor is a retired gardner and landscaper who has a beautiful garden with flowers and lots of fruits and vegetables. The kids I nanny have a fruit and vegetable garden. Lots of raspberries, tomatos, squash, rhubarb, blueberries, etc. Its always great to go pick in the garden on a hot afternoon! I like the Botanical Gardens at Fayetteville, Arkansas. I would model any garden after my dad's garden. Its where every spring I walk bare foot planting seeds, its fed and nourished me, its where I learned about plants,soil, animals and my own family history,and its where I got to spend a lot of great time with my dad. Sorry I missed the comments by 49 minutes, but I did get to see Monet's Water Lilies at the Museum of Modern Art in NYC last Thursday. Stayed tuned to my blog and I will post them soon.